Bookmark this page for ongoing insights on U.S. tax reform. Watch this video to learn more about what you'll find. While the journey to enacting major U.S. tax law ended with the signing of H.R. 1— originally known as the Tax Cuts and Jobs Act (TCJA)—in December 2017, the implementation road carries on. 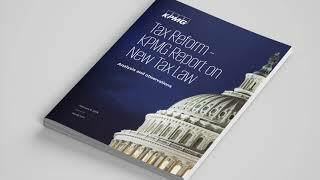 Check back here frequently for ongoing insights about U.S. tax reform from KPMG LLP (KPMG) to help make staying abreast of developments easier.